Marty’s off to New York for a couple of days and, as H.o.p. was going to be missing him, Marty prepared yesterday a big pot of red beans that would simmer and simmer and simmer and be prime eating by the time Marty was doing the sound check for his gig. So while Marty was in New York, H.o.p. would be here eating his favorite red beans and rice. It was a gorgeous day yesterday. The weather is unbelievably perfect. The several windows that aren’t sealed shut with time and paint we have been keeping open and the slightly cooler air mingles with the smell of the red beans and andouille making something like heaven on earth these first autumn days. Early this evening I go in to prepare H.o.p. his bowl of red beans and andouille. It’s not quite thickened enough but it’ll do and smells beautiful. I glance out the kitchen window to my left where we have an exhaust fan lodged that’s capturing the smell of the beans and broadcasting them out the back alley, and there’s George waving his arms ecstatically. He has smelled the red beans and andouille and they are calling to him. I give George a bowl of red beans and andouille which he’ll carry back up to his apartment where he’ll prepare his rice. We’re not having rice today as Marty’s not here and H.o.p. doesn’t like rice. He likes his red beans and andouille straight. And that’s why I love this old apartment building. I like looking out and seeing someone waving their arms enthusiastically over the aroma of red beans and andouille and having quite enough to prepare an extra bowl. Shorty’s has great pizza. And Key Lime pie. I know because we went out there tonight to see King Johnson. That link is to their myspace page where they have some songs up off the 2005 album that Marty mixed. Great fun, funky band. This was one of of their two reunion shows. I love Oliver Wood’s playing and was really looking forward to this. And some good pizza and good Key Lime pie. Shorty’s is a good place for kids. H.o.p. went. We stuffed ear plugs in his ears. For the second set, at the request of the audience, they cleared a space for a dance floor, pushing tables out of the way. H.o.p. drug me out on the dance floor. Marty (who can’t dance) held the table. H.o.p. was a dancin’ fool. Had a grand old time. Around five songs into the set he finally tired himself out and we left. He likely would have been up dancing to Heston’s music at Center Stage Friday night if there’d been a dance floor, but there wasn’t. Heston was opening for Liz Wright and had a standing ovation all around at the end of his show. He’s a fine showman. A sincere singer and showman whom Marty’s worked with for a while and the CD, “StoryTeller”, is finally coming out August 19th. He’s getting some nice advance reviews. On Storyteller, Heston proves he is a soul original. After so many recent misfires by heavily marketed, but underwhelming “soul” singers, it’s nice to finally witness a debut artist fulfill the hype. For that, Heston, we thank you. Highly recommended. In March, Heston broke SoulTracks’ one month download record with “Brand New U”. I love taking H.o.p. to see people he knows perform. And he loves going and is one of the best young fans anyone could have. Attentive in earnest and appreciative. He loves a good show and is eager to reward with enthusiastic applause. And, when there’s a floor, he’ll dance with a wonderful kind of gently tethered abandon, and what I mean by that is a mix of youthful disjointed funk, disco arms, ballroom twirls, walk-like-an-Egyptian hands and country square dance liberally punctuated with pogoing. You can’t ask any more out of a fan than their showing what a good time their having, and H.o.p. delivers. There we are driving down Boulevard on our way to get ice cream for H.o.p. and I see a pint-size purple restaurant with a couple of tables outside and customers headed inside and big letters proclaiming honest to god New Orleans PO’BOYS! Marty had already proposed eating out, which I’d nixed, though we were all starved as it had been an afternoon filled with shopping on empty stomachs. I just did not feel like eating out. We were frazzled. Shopping for paint for the kitchen (I still love our landlord but he never painted it after ripping it up when replacing pipes last autumn) with a bored ten-year-old boy and trying to settle on colors with a bored ten-year-old hopping around wears on the nerves. Seriously, I’m choosing colors I’m going to have to live with how long, colors to go in about a 3 by 3 foot space, no one’s helping, Marty wants nothing to do with it and I’m suspecting whatever I choose is going to look like hell no matter what, it’s going to be Dirk Bogarde in “Death in Venice” lying on the beach with his vanity-of-vanities rejuvenating hair dye and make-up and rouge melting all down his face. You’d understand better perhaps if you knew how hot and greasy our kitchen gets which isn’t really a kitchen but a small (almost) 100 year old room which may have once been a boiler room and into which was squeezed a stove, refrigerator and sink. Having seen a bathroom in an apartment decorating blog painted a magical evening blue, I’d been talking blue the past few weeks. Marty said finally for me to stick with the blue idea and H.o.p. pulled out of the Behr paint section just the right blue when I couldn’t find it in the Glidden. I stood around for too long afterwards considering considering and considering some more then at the last minute I opted for a “sweet honey” to go on the lower half to give a dash of brightness as there’s no sunlight in that room. At the moment it sounded great. H.o.p. was, truly, fit to be tied by the time we were done and we were all half starved. Thus the promise of ice cream for him and a stop by Grant Park for some running around time before fixing dinner at home. It’s been a long time since I’ve had a Po’Boy. And now here was this little purple place, Just Loaf’n (that link’s an opportunity for you to view a commercial of theirs), promising real New Orleans crawfish boils and Po’Boys. How long has it been there? I don’t know, but Sunday was the first time my eye lit on it. As soon as we found the ice cream shop was shut down we headed back to Just Loaf’n. After ordering we sat at one of the three tables in the shop, drinking Community Coffee, and stared just stared at the kitchen with high hopes. After a while of sitting and staring, H.o.p. said he thought it was getting a bit long and I told him no this was not too long at all not at all at all for a Po’Boy, just as the sign on the wall cajoles to be prepared to patiently take your time and wait for a good New Orleans Po’Boy prepared with fresh ingredients. The Po’Boy we had yesterday was saucy fairly falling apart under the weight of its own juiciness wonderful good (I don’t know why it is that the pickle in the Po’Boy always tastes extra special). It made me happy. How true blue it was I honestly don’t know, all I can say is Marty approved and it stood up well to the memories I have of Po’Boys past (admittedly long past), it wasn’t dressed up to be anything more than what it was and its weight and its dressings and its textures and all the mixings of flavors were such that it didn’t need to be dressed up to be anything more than what it was, which was really crumbly good. I didn’t care for the dirty rice but slather it with hot sauce and it’ll serve okay. Though blander, the dirty rice actually wasn’t far removed from what I’ve had in NO. I just like Marty’s dirty rice better. Their Old National Highway location promises muffalettas. 24 hours a day. The Boulevard location is only open 24 hours on Friday and Saturday and doesn’t have muffalettas. I love Central Grocery muffalettas. Every time we pass through NO I get a Central Grocery muffaletta. I wonder what a Just Loaf’n muffaletta would be like? We’ll have to drive all the way down to the airport to get one and see. Think what you will of that. He was smiling and thought he was being really magnanimous. I pulled myself up out of bed and not for him but because I was suddenly feeling a big craving for something sweet, blearily I took out a packet of dry potential cookie dough he’d had us pick up, he having thought it was a great idea to make cookies out of a packet of dry potential cookie dough. I blearily added the butter and egg. I’ve rarely met an inedible cookie dough. This wasn’t the stuff of cookies. I tried making one pan. The result was truly loathsome bad cookies, not fit for consumption. He put the spoon down in the sink. “You want any more?” I asked. “No, thanks,” he said, backing out of the kitchen. I ask you, have you ever met a child who would refuse cookie dough? It was like sawdust! It looked like sawdust. It tasted like sawdust. The few cookies I made of it looked like sawdust that was trying to figure the hell out what it was doing in the oven and not coming up with a clue. So, he makes a jello man that falls to pieces because it wasn’t made from the Jiggler recipe (two big boxes and only a couple cups of boiling water). So, I formed a plan. And there you have it. Two boxes of jello and only a couple of cups boiling water does the trick. 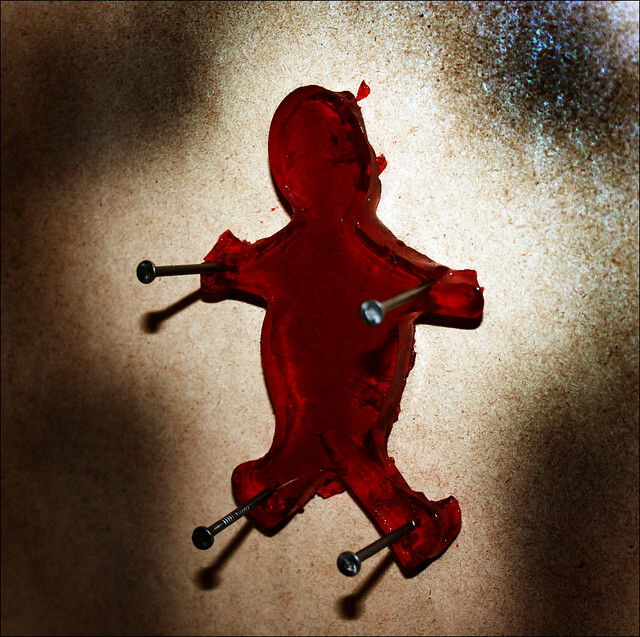 I nailed Jelloman to the wall. Well, it was to a board actually. But I have several pics of its standing against the wall to prove that I did it, in case anyone thinks it’s lying on the floor and not standing. Now I can get down to writing for the evening. Update: I see I’m getting suddenly a fair number of visitors to this post tonight, courtesy the presidential debate (what a strange world it is) and a poster at Metafilter wondering as to the veracity of McCain’s statement on the difficulty of nailing jello to a wall. 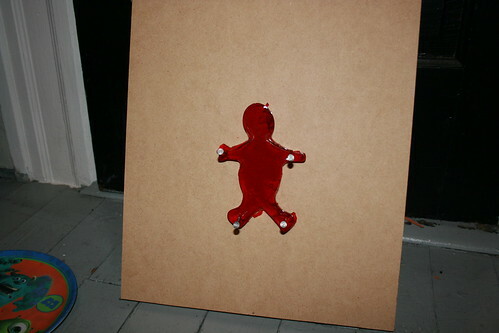 Below is another shot of our Jello man, showing that the board was indeed upright (in case there are doubters). Jello Man stood up quite well and probably would have lasted a little while longer than the few minutes we sat happily ogling our achievement before we decided what’s done is done and over with and cleaned things up. You know those pot stickers from Publix that your child is insanely crazy about, which make your closet-sized kitchen stink like boiled cabbage for hours after you’ve microwaved them? Well they work a potent magic in the child’s intestines as well. So if that child slides up next to you with a sly grin on his or her face, run. H.o.p. and I just had a race to the other side of the apartment as he was as eager to get to some clean air as I was, but he was laughing all the way because there are few things funnier to an eight-year-old H.o.p. than his farts. Just finished eating a banana popsicle in honor of the one banana popsicle I had as a child. It wasn’t the same and I don’t think the cause is solely the intervening years and faulty memory. When I was little and the ice cream man came around in Richland, I’d a friend who loved banana popsicles and I distinctly remember the smell of them. And I remember eating one once. A double popsicle. And it wasn’t bad. In fact, it was kind of nice. So we have this box of Rainbox popsicles because I wanted fruit juice popsicles for H.o.p. and these were the only popsicles they turned out to have. The flavors are sour apple, strawberry that’s so sour it ceases to taste much like strawberry, banana and bubblegum. What fruit is bubblegum I don’t know but those are the only popsicles that H.o.p. will eat of this box as he says the apple and strawberry are nasty. The strawberry and the sour apple flavors are pretty unpleasant, real jazzed up; I may love tartly-flavored fruit candies but it doesn’t work so well with popsicles. I smelled the banana popsicle and it didn’t smell, but I’ve been stopped up all day too. I remembered banana popsicles smelling of ripe bananas. I asked H.o.p. what it smelled like. He could smell something I couldn’t and said, “Yuck!” I said what did it smell like and he couldn’t identify it. H.o.p. loves bananas. Obviously, this didn’t smell like bananas to him. It half-way tasted like bananas, mellower in spirit than the other flavors, but in some ways didn’t taste like a banana at all. It certainly didn’t taste anything like that banana popsicle I remember from my youth, nor did it have at all the same texture. Of course, some of the experience of that banana popsicle was not just the popsicle but the freezer of the ice cream man’s truck, the dry but egg-frying heat of the desert and perhaps the aroma of DDT, because seems that the ice cream man had a way of appearing in close proximity of the DDT guys fogging for mosquitos. Maybe because of the way we kids hopped on our bikes to follow the sweet DDT smoke. Which means the ice cream man didn’t always appear in the hot hot of the day as the DDT trucks went around in the early evening. Yeah, bright, chasing after DDT. But we had no idea it could be dangerous. These popsicles always leave me feeling thirsty, whereas the sweeter popsicles from when I was a youth appeased thirst better and were solid and cold enough one had to lick at them a little while befoore feeling the inclination to bite into them. I followed the banana popsicle up with a strawberry and I’m full but thirsty which is kind of unpleasant. For a long while after the tastebuds feel like they’ve been scoured with a sour loofah in way that begs you wanting to relieve the sensation with something really wet but nothing is so sweet and wet to get rid of the feeling. The only thing that wet is a big glass of just plain old ice water taken in lieu of the popsicle. It’s good to occaionally eat some of these popsicles though. It reminds me of what H.o.p. might be feeling when he has a popsicle and then begs for another, then eats another and immediately wants another. He loves the popsicles but they never quite satisfy him either. They don’t fullfill. They just make you want more popsicle because you’re now thirstier and something in the popsicle makes you feel like if you just had another then it would do the trick. But it doesn’t. Update: H.o.p. says he always just wants more popsicles because they taste terrific. H.o.p. right now is excited about any movie that comes out, as long as it’s not frightening. H.o.p. : That’s not a scary movie is it? H.o.p: It’s a funny movie? H.o.p. : We can watch it! Me: Uhm, I don’t think you’d much like it. H.o.p. : That’s ok. Kissing isn’t scary. Me: It’s a movie for adults. H.o.p. : Why? It’s a funny movie. H.o.p. : But it’s funny! There’s a woman in it who uses a hamburger to wash her car! That’s funny!! Soooo, the Paris Hilton parody part of the commercial was the part that caught his attention. But it’s seemingly because she’s washing the car with a hamburger! And that’s funny! I read the movie isn’t funny, however. I read that it’s pretty much a disaster. Anyway, I think that’s kind of amusing. When H.o.p. sees the Paris Hilton parody part of the commercial, he sees a woman using a hamburger to wash her car and finds it hysterical. You see, I typed into a search in Gourmet Foods (at Amazon) the search term “European” just to see what might come up, rather than, y’know, buying everyone Xmas steaks (haha) or something like that. The truffles came up. Too expensive. Next page was this gourmet European item. 10 ounces of Dole European Salad in a plastic bag from Gristedes Supermarket in NY. Includes romaine and leaf lettuces, Radicchio and endives, is triple washed and has no preservatives. It costs $3.99 and only about $4.95 to ship. Sure looks good after those 16 ounces of truffles for $1050.00! Oh, I see the lead ingredient is iceburg lettuce. I loooooooooove iceburg lettuce. Tres european. North. Like Norwegian maybe. Plucked by nimble reindeer lips. Posted on December 15, 2005 March 10, 2014 Categories Everyday StoriesTags a, FoodLeave a comment on Ok, how about this? “Now you have to admit you don’t hate squid as much as you thought you did,” says my husband. I’ve been going through pictures of new lemur species and the find of the ancient mososaurus found in Texas and the ancient sea monster Dakosaurus andiniensis, reading the news stories to H.o.p. We look at a few pics of giant squids. I was about to refer to a post I made several days ago about how global warming will be good for kalamari and how much I hate kalamari and squid, but I fortunately remembered I never made that post. However, Marty is well aware of how much I hate kalamari and squid and octopus. I’m telling H.o.p. about how some people eat octopus and squid and I’m telling H.o.p. how I hate it but his dad loves it. Imagine several more rounds of me yelling that I have not been eating squid. My husband is the primary cook around here. If he’s telling the truth he’s referring to something he cooks. That’s just plain mean. That’s like when his mother tried to pass off her garden zucchini on me in casseroles and I hated zucchini. My husband is just like his mother! Huh. How do you like that, Mr. Cook. I really ought to pay more attention to what’s going in my food. See the above pic? It’s from some Raleigh North Carolina exhibit, dated 1952 and it is testament to two things. First, it testifies to the fact that people were already eating TV dinners before they came in foil trays. 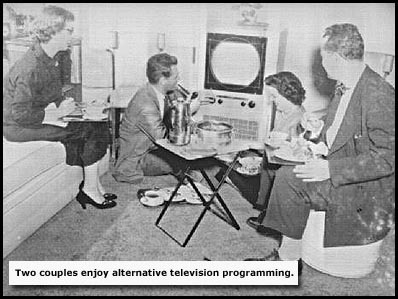 Second, collapsible TV trays existed before foil-packed TV dinners. 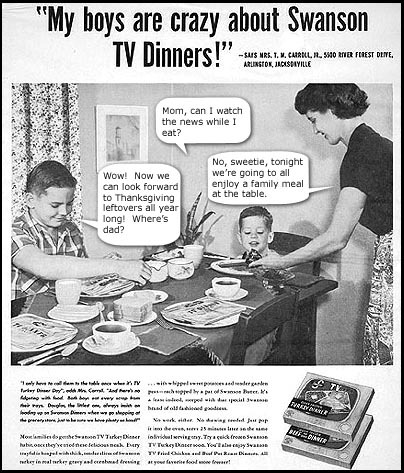 Had the picture been taken a year later then the family would have been eating out of foil tins at the table, For it was in 1953 that the TV dinner was invented, and Skookum sends notice that the inventor of the TV dinner has passed on at the age of 83, of cancer, which we can’t blame on the TV dinners because it turns out he was a gourmet cook and never ate them. If I gave half a damn I’d go out and buy a TV dinner in memoriam of Gerry Thomas,who figured out what to do with 520,000 pounds of unsold Swanson Thanksgiving turkeys that, as there wasn’t room in the Swanson storehouses for them, were stranded in an American twilight zone of refrigerated railroad cars, going from west to east coast and back again.